Mya Comes in 3 makeups but has so many tattoo layer options including 6 lipsticks, teeth, 2 blushes and 3 eyeliners. Below you’ll find only the basic three makes along with a few of the colors for HANDverk’s new Palette Necklace and Brush Earrings. These last two photos are not edited in any way and I’ve used Annan Adored’s Optimal Skin WL setting. 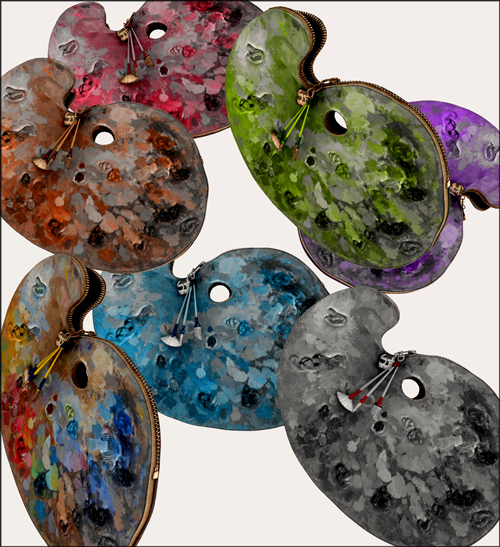 Here’s the full color palette for the earrings, necklaces and purses. Check out the detailing of the zipper on this darling purse!